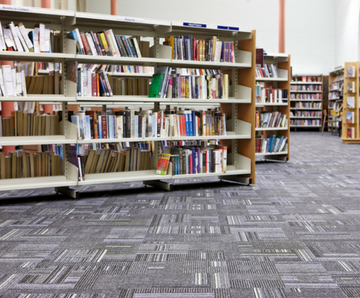 When renovating or making repairs at an older school, new flooring is often a top priority because of the heavy foot traffic that wears on the floors day after day. Once flooring and flooring accessories have been selected, you’ll need to choose the best adhesive for the job - wet or dry. Here’s a comparison of two options for installations in schools. School renovations are often on a tight timeline and need to be completed either as quickly as possible to minimize downtime when school is in session, or during long breaks while students and teachers are away. While the actual time spent laying new flooring is similar with both options, using a wet adhesive will take longer overall because of the longer curing time and the time required to diffuse harmful fumes and VOCs if present. So, if time is of the essence, we recommend using a dry adhesive. Dry adhesives don’t require any curing time and don’t have any toxic fumes. Without these delays, the flooring can be stepped on immediately. In fact, it’s actually beneficial to have foot traffic on the new flooring immediately when you use a pressure-sensitive dry adhesive like Lok-Lift, because that pressure from use continues to strengthen the bond. Schools see a lot of wear and tear thanks to continuous foot traffic, frequent cleanings, and tons of opportunities for accidents, like a science experiment gone wrong. Say there’s a chemical spill in a classroom lab with carpeted floors. If the carpet was laid with a wet adhesive, the entire carpet would have to be ripped out, the floor would need to be scraped down, and then the floor would have to be laid down again. This would be a time-consuming process because of the additional labor required, the longer curing time, and the time required to air out the harmful fumes associated with wet adhesives. But, if a dry adhesive like Lok-Lift was used, the carpet would also have to be removed and replaced. Installation time would be quicker, because there is no curing time. Additionally, use of a dry adhesive would pre-emptively help you prepare for damage or contamination down the line, since that future repair could then be completed more quickly. 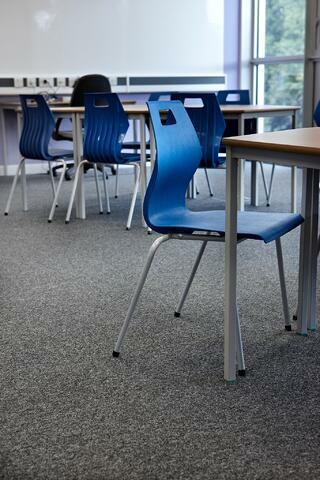 Asbestos flooring is a common problem in older schools. If the school you’re renovating has an asbestos issue, you have two options - abatement or encapsulation. Abatement involves completely removing the asbestos from the building. It requires ripping up the old flooring and closing down the school for weeks in order to ensure the asbestos is totally removed. After this is done, wet glue is typically used to lay down the new flooring. Abatement is an expensive and time-consuming option. On average, it costs $25 per square foot, plus the cost of filing for permits. Additionally, it can be difficult to find professionals who are adequately trained to remove the asbestos, adding even more onto the already weeks-long timeline. The other option is encapsulation, which can only be done with a dry adhesive like Lok-Lift. WIth encapsulation, you securely seal off the asbestos so it can’t get out into the air. This method is often far less expensive overall and can be completed much more quickly. It also helps protect the people working on the flooring since the process barely disturbs the asbestos fibers. So, if a quick turnaround time is needed or budget is a major concern, encapsulation with a dry adhesive is often the best solution. But, if the flooring is too damaged by the asbestos, abatement and use of a wet adhesive may be necessary. Make sure to consult with a specialist to determine which option is best for your scenario. Which Adhesive is Best for Your School? 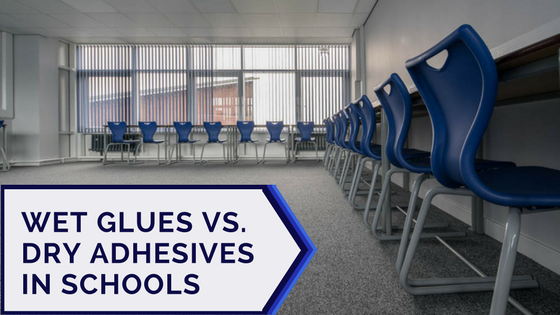 Every school has a unique budget and set of needs, so there’s no one-size-fits-all answer to the question of wet vs. dry adhesives. 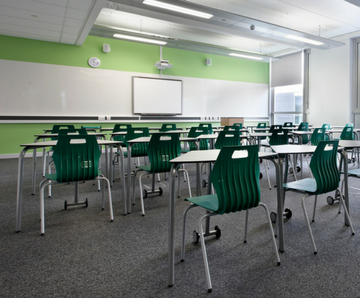 But, you can generally count on dry adhesives to be quicker to install, safer for students and teachers thanks to the lack of toxic fumes, and are safe for almost all types of flooring. Consult with one of our specialists to learn more about the best dry adhesive for your installation.